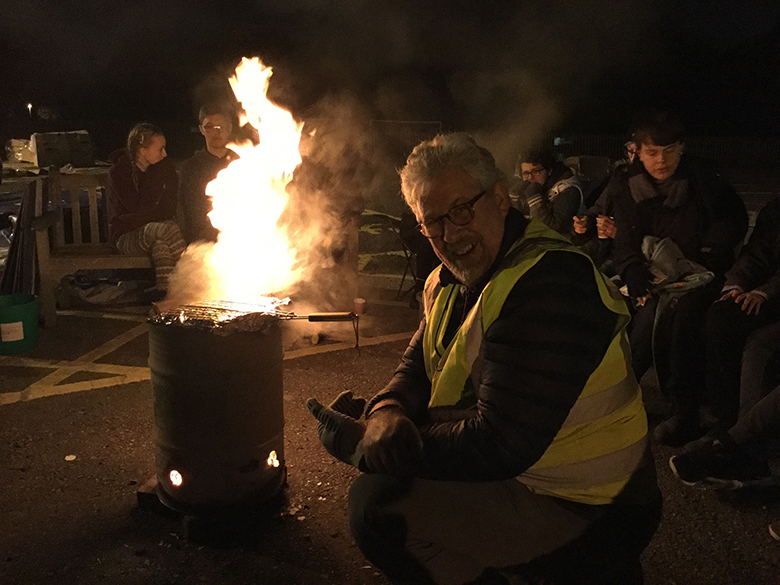 A group of 23 staff and students from The Sixth Form College, Solihull braved the cold to sleep outside for homeless charity St Basils recently. The challenge took place on Friday 14 October, with participants each given a cardboard box and a piece of plastic sheeting to make a shelter to sleep in outside in the College car park. To keep everyone warm, there was a bonfire, as well as lashings of hot tea and soup. St Basils are the beneficiaries of this activity, with staff and students collecting sponsorship. The final count is still being tallied, but approximately £300 has been raised in donations so far. St Basil’s work with young people aged 16-25, who are homeless or at risk of homelessness. They help over 5,000 young people every year across Birmingham, Sandwell, Solihull, Worcestershire and Coventry. Their services include accommodation schemes, homelessness prevention and support services to help young people regain the stability they need to rebuild their lives. This includes developing the skills they need to stand on their own two feet, get training and find employment. “This is a great cause and we are delighted to support St Basil’s who do such brilliant work for the homeless in the region. As staff and students, we are fortunate enough to have a roof over our heads, but this sleep out can at least give us all a flavour of what it is like to sleep rough.